I came across a thought-provoking piece in The Guardian on whether “development” is a “dirty word” which “eclipses the real issues”. The author, Deborah Doane, rightfully questions whether the term conjures an outdated kind of romanticism which distracts from the real problems of power and rights underlying most “developmental” issues. And to do so she invokes the work of George Lakoff, always a good reference if one is not familiar with the power of metaphors and the cognitive and political implications of language. Still, I wonder whether ruminations about terminology are really what stands in the way of “real” development. First, let’s get something out of the way: to paraphrase Shakespeare, Development by any other name would be as complicated. You can call it sustainable, you can call it inclusive, you can call it human or economic or transformative… If the basic problem is one of politics – and the Guardian op-ed and I agree on that – then the task of development is hampered regardless of what we call it. Empirically, development is hard because it is political. It is hard because donor agencies are not well-suited to dealing with the uncertainty and complexity of political processes, let alone its contentious nature. It is hard because there is no scientific guidance for it, with political science suffering from recurrent bouts of amnesia and economics envy. It is hard because it requires rich countries meddling in the affairs of poor countries. And – finally – it is hard because it usually goes against the interests and ideas of dominant elites. For all these reasons, development by any other name is necessarily a tough agenda to implement. That being said, is there any merit to debating such meta issues as what term we use to denote this agenda? Once more, the multifaceted nature of the development community confounds the issue: while on the research side we may strive for analytical clarity and empirical validity, on the NGO/charity side practitioners need to develop appealing frames for communication that can draw attention – and funds – to their work programs. So maybe I have read the Guardian piece entirely wrong by virtue of inhabiting the more academic quarters of the community. From an advocacy perspective, the term “development” is a double-edged weapon. On the one hand, it neutralizes some of the more controversial aspects of intervention – the contentious aspects – by cloaking them in a broader agenda of “helping the poor”; in the short term, that’s not a bad tactical move for getting donations and pre-empting opposition. 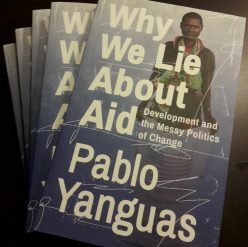 On the other hand, in minimizing or hiding the political side of development, advocates are also likely to generate false expectations among the public and politicians, who will wonder why projects keep failing or underperforming if all we have to do is “help the poor”; in the long term, a depoliticized terminology can lead to a backlash against the development community for its ostensible failures. So perhaps Deborah Doane is more on target than I give her credit for: while a change in terminology is likely to have minimal impact on the quality of our analysis or the intricacies of real-world problems, it may have a significant impact on the larger conversation about development in donor countries like the UK or the US. The time may be ripe for an advocacy and communication strategy that brings politics out of the development closet.